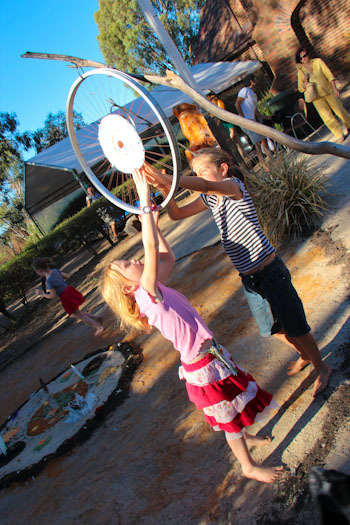 The Melbourne Didgeridoo and Cultural Festival introduced us to the large Westerfolds Park in northeast Melbourne where the Mia Mia Gallery of Aboriginal art is located. 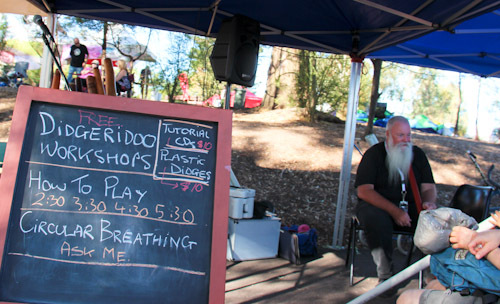 Yesterday, the gallery precinct at the top of the hill was transformed into a thriving market and entertainment space as didgeridoo players, groupies and appreciators of Australian Indigenous arts came together to celebrate. 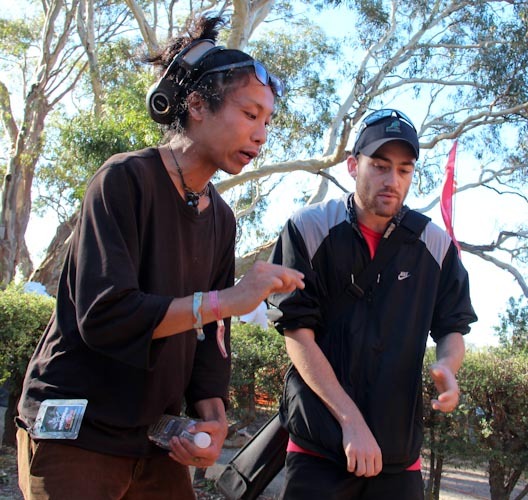 Passionate about the didgeridoo, Stax offers didges for sale, merchandise and free workshops. This stallholder allows his pet python to roam the marquee frame while he talks with customers. Col demonstrates his singing bowl. He makes these and pentatonic drums out of recycled gas bottles. Col’s drums sound absolutely amazing. He donated one as the festival’s raffle prize, and I’m sorry we didn’t win it! 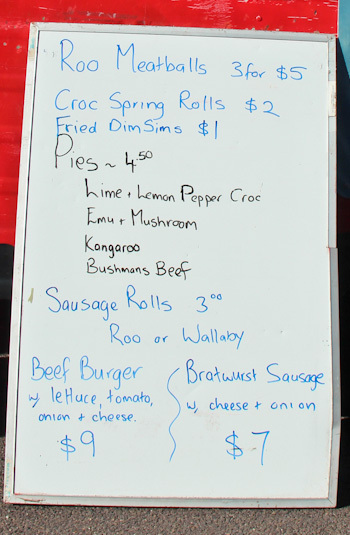 Some particularly Australian meats are on the menu at this festival. 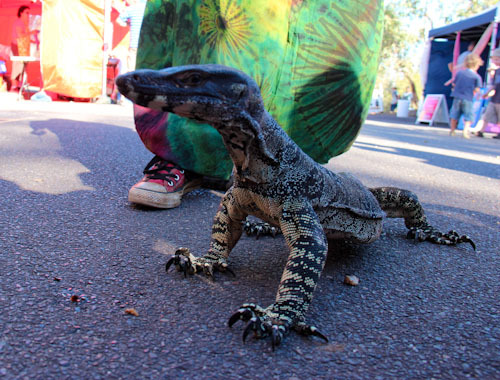 Geri the goanna is brought along to the festival by his carer. It's fantastic to see a goanna so close up, as they're usually running away from us when we encounter them in the wild. As well as browsing the market stalls and listening to the music, we enjoyed exploring the gallery precinct. The art gallery has an amazing collection of Indigenous artworks for sale, although they particularly ask visitors not to photograph them, so I can’t share the details with you. 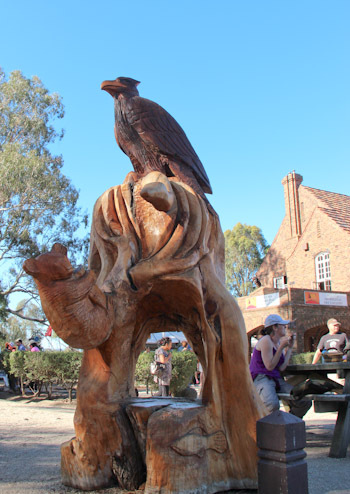 Chainsaw stump sculptures outside the Mia Mia Gallery depict the native animals that live in and around Westerfolds Park where the gallery is located. 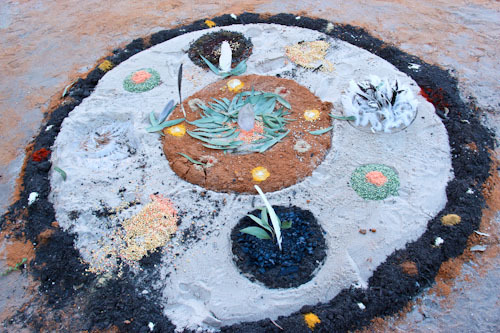 An artist has fashioned this circle with sand, grains and spices and decorated with crystals, leaves and festivals. 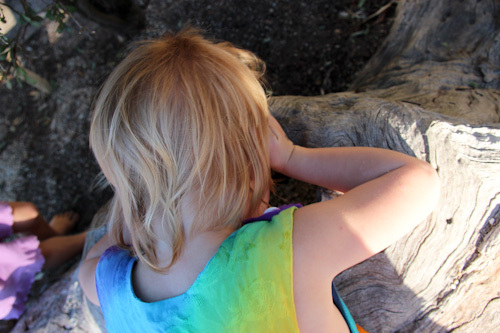 Delaney peers into the hole in a log. Our girls love roaming the festival site with Lily. Our girls were thrilled to be reunited with their travelling friend Lily whose father was performing today as part of the festival. 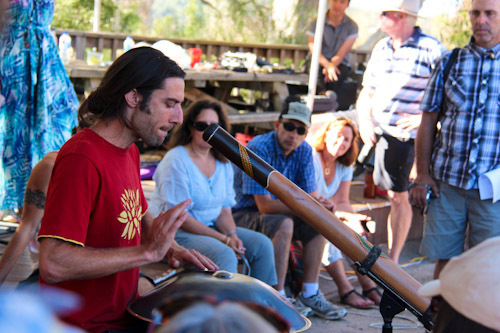 Jesse Lethbridge is a brilliant didge performer as well as a creator, and he was very well received by those who have his didgeridoos or know his music. Jesse Lethbridge moves off the stage to the same level as the audience as he explains his instruments and the techniques he uses when playing. 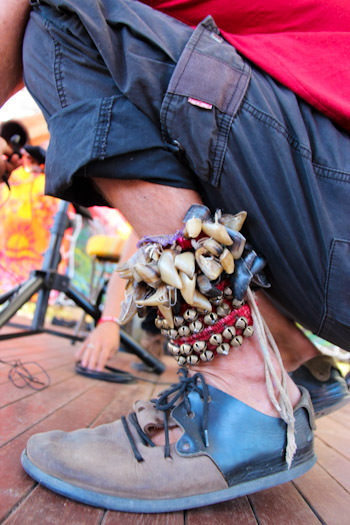 Jesse keeps a band of bells around one ankle to provide extra percussion while he plays. 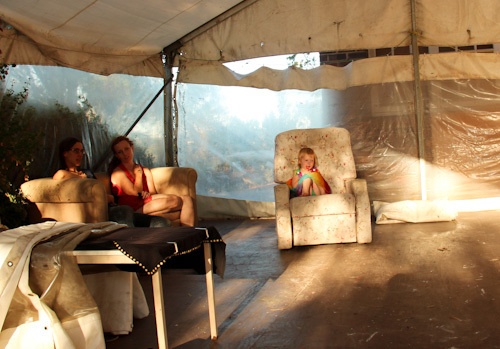 The vibe at Didge Fest was relaxed, inclusive and authentic. Stall-holders interacted very personally with browsing customers, and our girls loved buying little Australian toys from one friendly vendor. Although the program dictated the line-up, musicians improvised, inviting other performers on stage with them. We're privileged to witness the reunion of two friends who spontaneously start a beat-boxing session that lasts about ten minutes. 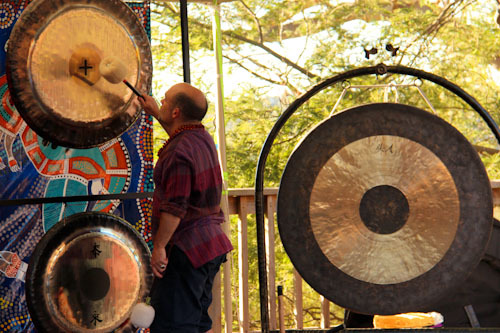 Niknarmada's Adam Rankin plays the gongs to the accompaniment of three didgeridoos. Rosi and I find a quiet corner to catch up while the kids play. I’m glad we got to spend more time with the Lethbridge family again. Seeing Jesse play is a treat, too, and the girls love playing with Lily. 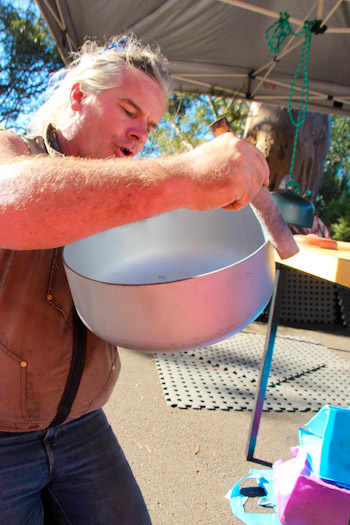 With all this — and more — happening at the Didge Fest, this was a memorable outing in the wonderful city of Melbourne! You document your adventures so wonderfully thoroughly; I wish I could go every place you take your girls! This looks like a particularly great festival. I especially love that picture of the menu.